The myth is that private jets are just for luxury or top-level CEOs. But in reality, they can be a wise business decision for small and mid-sized companies. Acquiring a private jet for your business involves a lot more than simply purchasing a jet and jumping on board. There are several safety, maintenance, regulatory, and personnel concerns to consider. That’s where Mountain Aviation comes in. We can help you with every step of the way in either acquiring, staffing, and maintaining your own jet or renting a fully-staffed one, starting with this article. It’s our ultimate guide to getting started with a private jet for your business. The first thing you need to do before obtaining a private jet for business use is identify your exact needs. What are your goals regarding use of the aircraft? Make a document outlining why your business needs a private aircraft, and how one will help achieve the goals. For example, if your company’s goal is to increase efficiency and save money, you may be able to do a cost analysis and show that between employee time and travel expenses, it’s more cost-effective to use a private jet for certain applications. 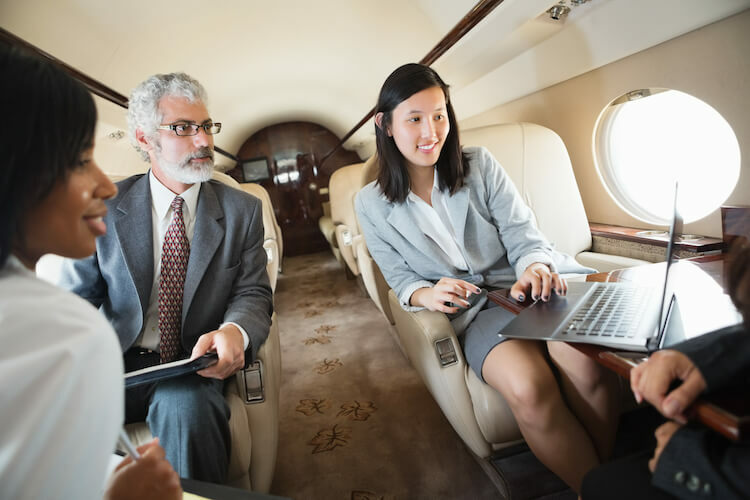 Once you’re set on obtaining a private jet for your business, the first step is to develop a thorough company policy that dictates all aspects of using the plane. The initial cost of purchasing a private jet can create sticker shock. But beyond the base price, the goal of a private jet is to help your company save money in the long run. The key is to be smart in choosing the right plane to suit your needs, and to factor all possible costs into your budget. And don’t forget taxes, which we’ll outline later in the guide. Maintenance: $700,000 to $4 million per year. Fuel: $53,000 per tank (on average). Many of the costs listed above are tax deductible. According to federal law, any “ordinary, necessary, and reasonable” business use of the aircraft can be deducted from your company’s taxes. The use of your business’ private charter jet has to be directly associated with the work of the business. Any “lavish” use is not considered to be deductible. Non-deductible expenses might include sending an employee’s spouse along on a trip, a stopover in Milan for leisure in the midst of a business trip, or allowing an employee to use the private jet for a vacation. You can still use the plane for non-business applications, or for uses that perhaps blur the line between business and leisure — you just can’t deduct all the expenses for those uses. For example, if your employee brings their spouse with them on a business trip to London, and they include a stop for a weekend in a Dublin to see the sights, any costs associated with the extra person and the stop in Ireland are to be considered non-deductible, while the remaining costs could be deducted. That’s why it’s important that you have rules set in place to document all use of the plane so that you can accurately report the percentage of costs associated with business use for tax reporting purposes. Consult an expert in aircraft accounting to fully understand the tax implications of using a private jet for your business. Your jet will need a pilot and a co-pilot — the pilot being first in command, and the co-pilot being second. Beyond that, you may desire additional staff, such as a steward or attendant. Below we’ll focus on just the essential staff considerations. Hold an airline transport pilot certificate. Have logged at least 3,000 flight hours with 500 flight hours in the type of aircraft utilized by the business. Hold a first-class medical certificate. Meet all requirements regarding instrument flight time and night landings. Pass an instrument competency check in the type of aircraft to be flown. Have logged at least 500 hours as pilot in-command in a turbine-powered aircraft (if the pilot will be flying as a captain on a turbine-powered aircraft). Hold a commercial certificate with appropriate category and class ratings. Have logged at least 1,500 flight hours. Meet all currency requirements regarding instrument flight time and night landings. When you hire pilots, you’ll want to be certain to comply with the Pilot Records Improvement Act (PRIA) to verify the safety record of the pilot. The Federal Aviation Administration (FAA) provides guidance for complying with the law on their website. You can also access the full document covering the intricate details of the law and compliance here. Hiring your own maintenance staff isn’t always necessary, unless you own a fleet of aircraft. In this case, your aircrafts may require enough consistent maintenance work to require a full-time staff. If you’re interested in hiring your own maintenance staff, you can review the NBAA’s notes on aircraft maintenance staffing here. But if you’re only looking to acquire between one and three private charter jets for your business, leave the important work of maintenance to the pros at Mountain Aviation. We can care for your plane with a full staff of aircraft maintenance technicians. Safety is many people’s top concern when obtaining a private charter jet for business. Mountain Aviation has a long track record of safety in the private sector. And in our 20th year of business, we were awarded the NBAA Safety Award for its track record and high standards. More recently, Mountain Aviation joined the Air Charter Safety Foundation, supporting the highest levels of safety in the aviation industry. From pilots averaging 8,000 flight hours in experience and FAA licensed aircraft maintenance professionals who receive ongoing training to FAA certified dispatchers and flight crews who check and double check every aspect of every flight before takeoff, Mountain Aviation takes safety in the air seriously. That’s why you should look no further than Mountain Aviation for your business jet needs. If you’re just looking to dip a toe into using a private jet for your business, we can rent you a fully staffed airplane on an as-needed basis. And if you’re ready to buy a jet, we can assist with every step of the process in finding and acquiring the right aircraft for your needs, as well as store, maintain, and pilot the craft — all in compliance with the most rigorous of safety standards.